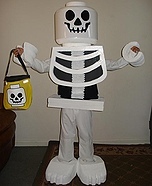 Halloween costumes are often a huge deal for both children and adults alike, and there's really no way to go wrong, as you can combine your interests, childhood memories, creativity, and personality all into a single Halloween costume. 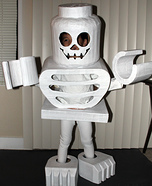 The best way to do this, however, is to take the risky task of creating your own costume. Homemade Halloween costumes can be perfected to each individual's taste, and it's always more fun to receive compliments for arriving in a unique costume, rather than the same costumes all your friends have from the local Halloween superstore. 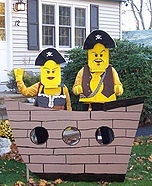 One of the most beloved childhood activities, playing and building with Lego's, have been making their way to the top of popular homemade Halloween costumes. Their creativity and realistic build make people curious as to how you did it and will probably want to snap a few photos as well. 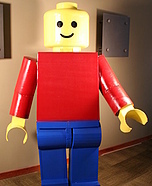 It can often be difficult to find Lego costumes that are really neat and stand out, however, many have found that by either customizing the costume themselves, or hand making it completely, a pleasantly fun result for the much anticipated holiday is provided. 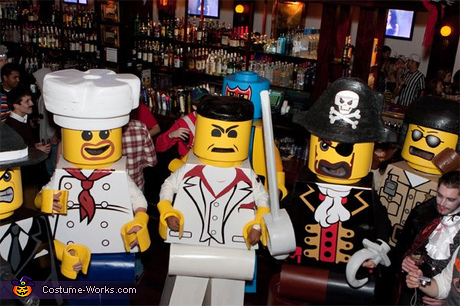 Whether your Lego men were hanging out at the top of a castle or building you built, or perhaps in a custom car, they made the activity come to life! 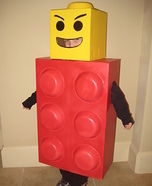 Just like the spectacular Lego creations you used to build as a kid, imagination is the key when creating your own Lego costume. There are no limits to creativity. 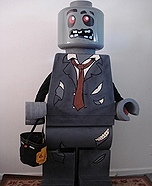 Anywhere from Lego Zombie Man, perhaps for the easily amused adult to Ninja Lego for the want to-be Ninja child, or perhaps the adult at heart. 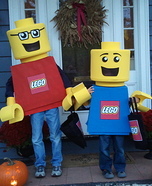 There are a million ways you could go with Lego costumes, and plenty of potential Lego costume ideas are available on our Halloween Costume Contest in the "Toys and Dolls Costumes" section. 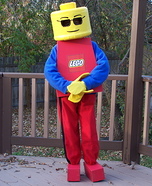 Be sure to check it out for your own Lego man costume inspiration. 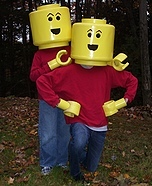 Lego costumes are original and everyone will be easily amused at your homemade Lego man identity at Halloween events or parties. 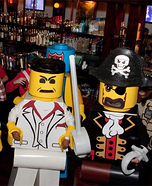 Another plus about these costumes is that you're able to spin your Lego head around completely, which is entertaining for any costume required event. Your family and friends will certainly be in awe of your creative attire. 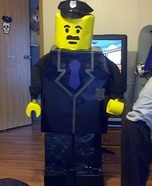 It's especially a plus if you're already an artistic person, as all you have to do is build your costume as you would build your favorite Lego man creation. 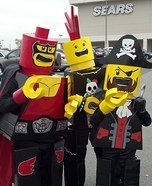 Homemade Lego costumes can be created by following some simple and basic steps. 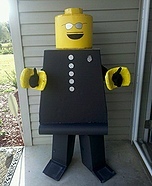 There's tons of tutorials on the web, but some of the basic tools you'll need to succeed in the creation of this exciting costume include: a big cardboard box (for the Lego man's head), tape, glue, glue gun, scissors, a ruler, black marker or sharpie, spray paint, a knife, and measuring tape. Most of these tools can be found around your home, which is a great when wanting to save money for Halloween costumes as well! More affordable than store bought costumes, plus unique! 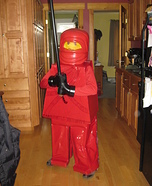 In addition to the above tools, there are also supplies that are easy to find and crucial to the making of the costume, including: circular bowls or containers (for the Lego eyes, mouth, and hole for its head), sand paper, copy paper, cement from a tube, Styrofoam instillation, high-density foam, fabric, yellow kitchen gloves, and every-day clothing such as a pair of jeans and a long sleeved shirt to match to your Lego costume. 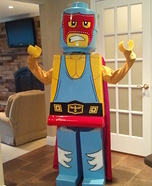 When deciding to create a Lego Halloween costume, you may be thinking "where do I even start?? 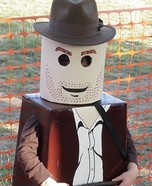 ", as this costume is little out of the ordinary and appears to require much effort and dedication. While it can be time consuming to make the costume, the end product or result will certainly be rewarding, and when everyone asks where you got your costume, let the bragging begin! 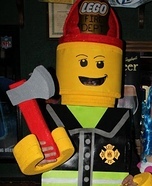 The most important part of the costume is obviously the head, because it will be the first thing people notice when they see the Lego man. The head is perhaps the most difficult to hand-make, and will take a fair amount of time; however, it is an essential part of your homemade Halloween costume and will probably be the most adored aspect of this original costume. 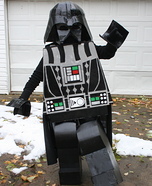 Some Lego costumes may take months to make, and some can be made within a weekend's time. Also, keep in mind you there are several alternatives to the making of the parts of the costume. 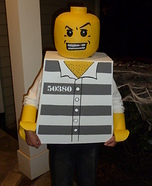 For example, you can use paper Mache instead of foam for the Lego man's head, even the creator of the Convict Lego costume in our 2011 Costume Contest proved amusable success with their homemade Halloween costume! 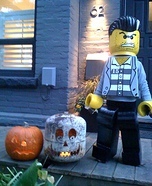 Lego's come in all different shapes and sizes, from mini-Lego men for the little trick-or-treater to the adult sized Lego man with no-limits to creativity for the party-all-nighter! The tools and supplies needed for each Lego man varies by its distinct nature. 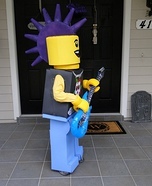 For example, the Lego Guitar Man Costume was made mainly out of cardboard Styrofoam and foam. 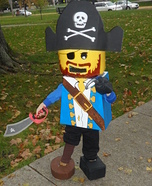 The Lego Mini Figure Pirate was made from foam, paint, and lots of duct tape. It's definitely best to just use your own judgment to find exactly what YOU will need and what is most convenient, affordable, and creative when making your own homemade costume this season. 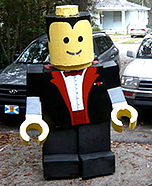 Lego men are a genre of costume not easily found at Halloween mega stores, so the best option for most is to create homemade Halloween costumes, which more often than not, turn out surprisingly brilliant. 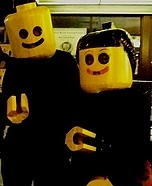 These costumes are perfect for children, adults, and even couples. 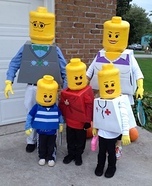 Be sure to check out Lego Halloween costumes on this page where so many have hand crafted their Lego costumes to match their individual interests and their own personal touch of creativity. 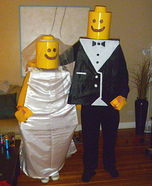 You'll find tons of ideas, including Lego Bride and Groom, Lego Indiana Jones, Lego Police Officer, and so much more Lego man inspiration! 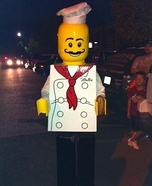 When wanting to portray your favorite childhood pastime for Halloween, Lego man costumes are definitely a winner!